One way to deal with the noise complaints threatening to shut down parties in Brooklyn this summer is to have everybody HUSH! On Saturday, August 15th, Caribbean Silent Events produced Brooklyn's first Caribbean silent party called HUSH on the rooftop of the Brooklyn Children's Museum. The concept is simple. Upon arrival, everyone receives a wireless headphone that connects to the frequency of three different stations. At any time during the event, the user is able to adjust the volume and tune in to another deejay. Once a station is selected, the LED light on the headphones switches to that deejays designated color. Find someone with the same color led light on their headphones and take a wine! Silent parties are not exactly new, but this was the first time the concept was extended to a Brooklyn Caribbean party. So what is the difference between let's say an EDM silent party and a Caribbean silent party? Well, for one thing, our music employs the call and response method so it is strange to hear people spontaneously responding in unison when you have no idea what is prompting them. Each deejay was able to see from the podium how much of the crowd was tuned in to his frequency. This led to a fantastic battle as they began vying for listeners. Blue: Frankie Please and Pink Candy of Spoil Brattz Sound were in the lead when I entered as they were the team playing mostly soca. I set my headphones to blue on arrival. If you've kept up with my blog at all, that should be no surprise. They were followed up by DJ XFactor who offered more of a variety of music, including hip hop and R&B. Red: DJ Notorious played soca and hip hop while his emcee moved around the crowd convincing people to switch their headphones to red. Notorious soon made way for Elegance Sounds. While Babyface needs no help getting people moving, those who were tuned in to the red station received a surprise when Erphaan Alves appeared and sang "Bumper Like Rain" live! Green: Team Green featured Kevin "Club Killa" Crown, who played everything from soca, to reggae, to dancehall, to old school hip hop (he even played Kris Kross), to R&B. I wonder if "club killa" is a misnomer since he demolished that rooftop. Have you ever seen a silent palance? Supa Roy kept up Crown's momentum when he took over as emcee while Natural Freaks played dancehall. He promised to mash up the party "with no bloodclaat artist" (a jab at the red team) and he did. Although this was not the goal of the event, I have to say that the battle was fun to watch and.. oh yeah, Team Green won. What made HUSH an epic event was the fact that patrons could control their party experiences. If you don't want to hear rap, flip the switch and party to soca. It was also interesting to see how quickly the vibes can change in a party. When I went to the bar, I saw mostly blue lights on people's headphones, after I received my drink, I turned around to see mostly red lights. By the time I made it back to the middle of the dance floor, I heard a large group scream out "I love the color green!" Promoters take note, the crowd appreciated the versatility of the deejays. While I am completely happy in the 100% soca parties, this is apparently not for everyone. Therefore, if you're only playing current soca hits, you may want to expand your repertoire. 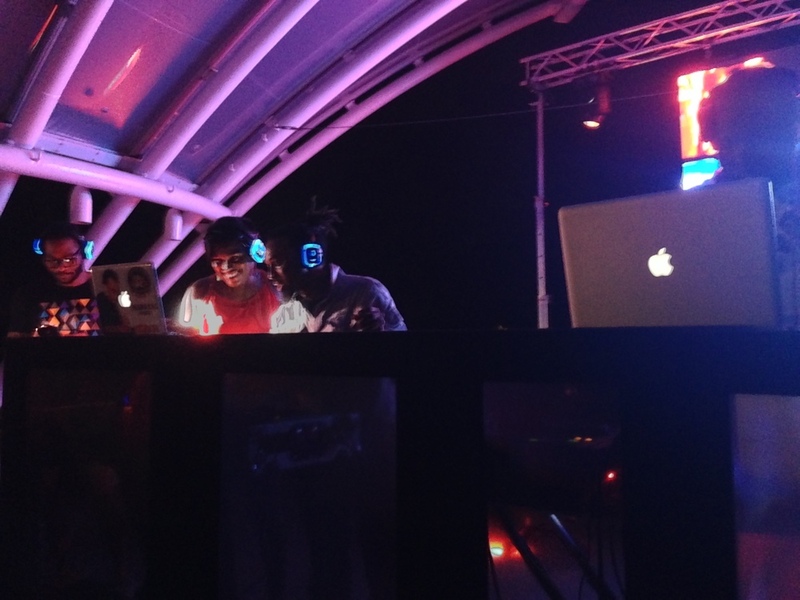 As evidenced by this event, party goers want a varied experience and deejays who can engage with the crowd. I doubt that silent parties will be the new standard of Caribbean partying in Brooklyn, but this did allow us to have a rooftop party in a residential area without angering neighborhood residents, so kudos to Caribbean Silent Events for that.